Welcome to Stockholm! You’re going to love the new Europe! Stockholm ‘youths’ as young as nine-years-old were caught by police after a series of robberies this week. 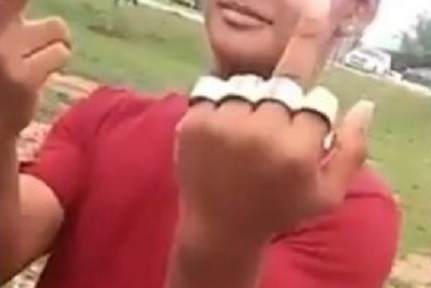 The children were caught with brass knuckles. Police have raised concern after groups of youths aged under 15 – one thought to be as young as nine – were caught robbing or trying to rob people in Stockholm last night. A reveller reported being robbed of their mobile phone at a bar in the popular Södermalm district of Stockholm at around 2am on Monday, getting hit in the face when trying to get their phone back. The victim did not need an ambulance, said police. The suspects, two young boys, ran off but were caught by police. An hour later youths on a bike tried to rob another person, also on Södermalm, armed with a “knife-like object”, said police. No one was injured and the robbery attempt was unsuccessful, but four young suspects were later seized by police in central Stockholm. All six were handed over to social services. Police officers in the Södermalm area wrote on Twitter that they were all younger than 15, one believed to be young as nine. “The youngest was nine years old. Tried to rob using brass knuckles,” they tweeted.